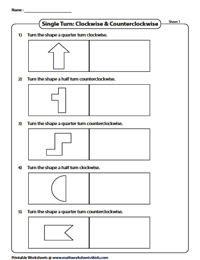 Slide, flip and turn worksheets have interesting practice pages to understand each move - slide, flip and turn, vertical and horizontal flips; clockwise and counterclockwise turns. 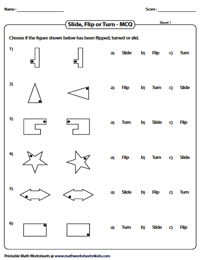 Also exercises to draw the flipped, slid and turned images of shapes are here. 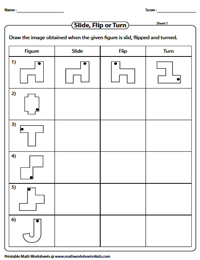 Printable slide, flip and turn charts are available. 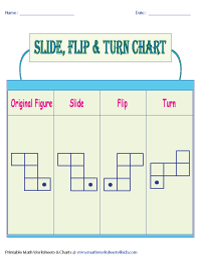 Two vivid printable charts are given for children to easily grasp the concepts of sliding, flipping and turning a figure. 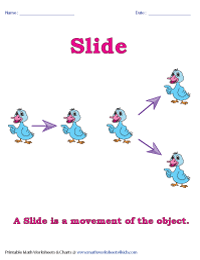 A blue duck, a pink owl and a green frog slide, flip and turn in the first chart. The second chart has a caterpillar which describes all the moves. Write if the move is a slide, a flip or a turn for each set of real-life images. 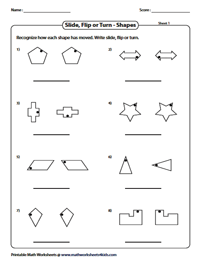 Each worksheet has eight questions. Look at the original figure and the image after movement. Write if the figure has been slid, flipped or turned. 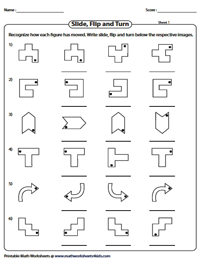 Move the given shapes through slides, flips or turns and draw the new image on the grid given in these worksheets. Choose the correct answer from the multiple choices that best describes the move. 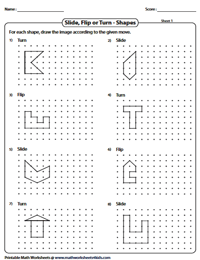 Each worksheet has six problems. Perceive the given figure. 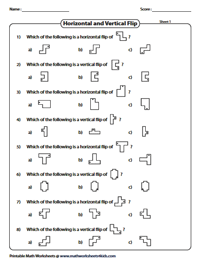 Identify the image which is not a mirror image (flip) of the original figure. The flipped image can be a horizontal or a vertical flip. Observe the given figure. Choose the correct horizontal or vertical flipped image from the given multiple choices. 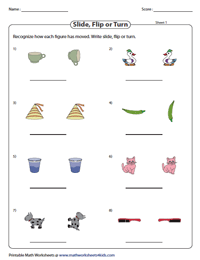 Draw the slid, flipped and turned images of the given figure. The flip can be horizontal or vertical and the turn can be clockwise or counterclockwise. Observe the movement undergone by each figure. Write slide, flip and turn under the correct image. 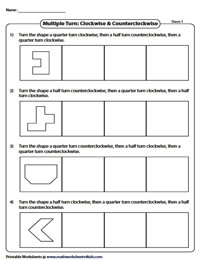 Read the instructions carefully and draw the shapes by turning them half or quarter in the clockwise or counterclockwise directions. 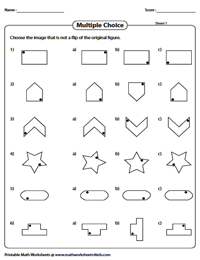 Rotate and draw the shapes half or quarter in clockwise and counterclockwise directions multiple times, adhering to the given instructions.